The platforming unit in oil refinery serves to process the sweet naphtha derived from NHT (Naphtha Hydrotreating) unit. The purpose of the processing is to obtain a product with a higher octane number, around 96. The platformer unit is typically designed to cultivate sweet naphtha with a capacity of 20 MBSD. All oil refineries that produce gasoline with octane above 90 definitely has this unit. At an early, the sweet naphtha that comes from NHT unit will be mixed with hydrogen, than heated through a HE (Heat Exchanger) with fluid from the bottom reactor. The feedstock is heated again in the furnace until it reaches a temperature of 543 degrees Celsius and then introduced into reactor. Inside the reactor, the feedstock will react in two stages. Hydrocracking, is a process of cracking long-chain hydrocarbons into short-chain hydrocarbons using hydrogen gas and a catalyst. Isomerization, is a process of change in the form of a compound molecule without altering its chemical formula. Once of the material has reacted in a reactor, will then be channeled to the separator to separate gas and liquid hydrocarbons. Liquid hydrocarbon directly channeled to recontact drum, while the output of the gas separator will be divided into two stream. The first stream will be heading to the drum, and a second stream is injected into the feed plaformer. In recontact drum, propane and butane fraction contained in the gas will undergo a process of absorption, so that the phase of two fractions will turn into a liquid phase. Gas produced from recontact drum will be channeled to NGWC (Net Gas Wash Column) which serves to reduce the content of acid chloride in the gas trough the injection of liquid caustic soda. While the liquid from the recontact drum will experience the process of expansion and then flows to flash drum resulting in evaporation of light fractions which can be used as fuel gas. After the light fraction in liquid has evaporated, then be channeled into the debutanizer column which serves to eliminate the content of butane. The output of debutanizer column consist of 2. First, the gas obtained from the top of column is used as a feed for LPG recovery, while the bottom column product is a reformate that will be used in the blending for making gasoline. So, do you already understand about the processing stage of sweet naphtha in platforming unit,? I hope so. Hopefully this article was useful to you. 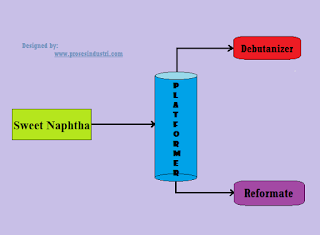 0 Response to "The Processing of Sweet Naphtha in Platforming Unit to Obtain Reformate"